When it comes to picking the “best” songs from a given time period, it’s a much more subjective chore than selecting the best albums or the best artists. Our relationship with songs is just so much more intimate. The emotions songs can touch tend to range so much farther on the spectrum. To discover a song that really touches you, it’s not just dependent on the songwriter to write and perform a compelling tune, it’s dependent on the listener to either be open hearted enough, open minded enough, or to be experienced with the same emotional sensations that inspired the song for it to score the deepest impact. The “best” songs feel like they were written for you, and you only. They’re uncanny how they meld to your little experiences, dredging up dormant feelings, reviving potent memories, unlocking lost learning, and most importantly, remind you of the richness of feeling alive, regardless if those emotions are ones of happiness or sorrow. Narrowing down the field of the “best” songs in 2015 proved to be especially difficult. And so to make it easier, the uncommon, but not unprecedented move of rendering a split decision was implemented. Two songs seemed to separate themselves from the pack, but both were too strong to separate from each other. When it comes to songs and songwriting, once again Texas and Oklahoma reveal themselves as the hotbed for this current era’s most compelling writers. 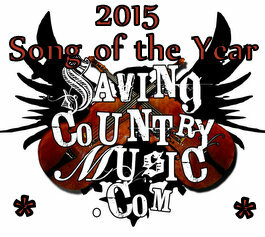 That was true for the majority of the candidates for Song of the Year, and it’s true for the two eventual finalists. It would be so easy for Oklahoma’s Turnpike Troubadours to turn into a party band, and blow up even bigger than they already have among young people and late night revelers. But you can tell that Evan Felker, the principal songwriter and frontman of the outfit, feels the pressure of his Oklahoma peers like John Moreland, former Troubadour John Fullbright, folkies like Samantha Crain, newcomers like Parker Milsap, and the ever-present spirit of Okie-native Woody Guthrie, to keep the songwriting effort at an elite level. Some songwriters must rely on wordplay or humor to woo you into relating, but Evan Felker uses the raw emotions of the moments that go on to define our lives. And so does Texas-based songwriter and performer Cody Jinks, and arguably never more potently than in the song “David” from his 2015 release Adobe Sessions. Though a much more dark tale, and a more specific one in regards to the story, it still includes that personal wallop all great songs must, and just like “The Bird Hunters” it’s a fiddle-driven tune fraught with emotion. Technology continues to cheapen the value of music. Artists who focus on songs first and entertainment second still struggle to get noticed in popular culture. But the crop of songs and songwriters, especially in the Texas scene, continues to be as strong as it ever was, and should be the first place to look for listeners who don’t just want to hear, but feel. Contratulations to the Turnpike Troubadours’ “The Bird Hunters,” and Cody Jinks’ “David”—Saving Country Music’s Songs of the Year. Can’t argue with these ones…especially Turnpike. One I would throw in there on personal opinion would be Willy Tea’s Chickamunga. Not that it’s super original just the imagery feels like you could create a whole movie off the lyrics to that one. David is an incredible song. I’d say Carlisle’s Haul was my favorite of the nominated songs, but I’m glad to see David get a share of the glory. Great song. Good choice on Bird Hunters. Children of Children is definitely an honorable mention. I personally think the first 8 songs on Something More Than Free could’ve been worthy candidates for Song of the Year, but I also completely agree with Trig on these two selections. I think McMurtry’s and Isbell’s albums (my top two of 2015, respectively) were loaded with great songs to the point where it’s hard for me to pick a favorite from each of those two. But I agree that the two SMM songs of the year are great ones. The nomination of David made me listen to the song again and inspired me to buy the Adobe Sessions album. A very strong album. Yeah I am with you on McMurtry and Isbell. And trig is right about the personal nature of the song, neither of those songs really move me. But also the more I resonate with an artist the more the songs appeal to me. Mike Cooley rights some brilliant country songs. Of course, His blog his awards. Makes sense to me. Interesting that you mention Mike Cooley. The beginning of David reminds me of Cooley’s A Ghost to Most from DBT’s Brighter Than Creation’s Dark. His song Primer Coat from English Oceans is one of my favorite songs from 2014 and Zip City is one of my favorites from the last 25 years or so. I hope he continues to write songs in the future at the same pace as he did for English Oceans. I think DBT works best when the songwriting is more equally shared between Patterson Hood and Cooley. Both great songs! My personal favorite song of the year is What A Shame by Shane Smith and the Saints. Runner ups would be They Don’t Make Em Like They Used To by Will Hoge, Mayflowers by Ashley Monroe, Ghost Town by Sam Outlaw, Broken Shore by The Black Lillies, Ashes by Lindi Ortega, and Born & Raised by Shane Smith and the Saints. Of course there were many other great songs too, but I think these are the very top. Two great songs no arguments from me. I love every tune on the troubadours latest offering. I just downloaded Adobe Sessions and Turnpike’s self titled not a bad song on either album. Trigger I’m not gonna lie, I was a shocked and little dissapointed in your choice. I thought it was unanimously known that “Crash & Burn” by TRUE country artist Thomas Rhett was the best song of 2015. I can’t believe you would choose these terrible songs for your best. I mean, come on, neither of these songs were on the radio. If you’re not on country radio, you’re irrelevant. Seriously, these songs use real instruments, have stories, and have heart and a message? Are you kidding me? No one wants to listen to that. Where’s the tailgate? Where’s the tan legs? Where’s the beer? Barely a country song at all. And a fiddle solo? No way, that needs to be replaced by a stratocaster immediately. Lil Dale learns to spell? Two great songs! Don’t always like dual award winners but in this case it was well deserved. Both of these artists deserve better recognition and hopefully they will get some more exposure in 2016. Happy New Year Trig and thanks for taking the time keeping this site rocking. I’m very glad to see that you choose two songs with FIDDLES in them as the songs of the year. People can say that a song doesn’t necessarily need to have fiddles to be a country song. It may be true, but to me a song without fiddles is not a perfect country song. Courtney Patton’s “So This Is Life” is also one of my favorite story songs of the past year. It’s 5 minutes of heartbreak about her parents divorce after 30 plus years of marriage. Hits you right in the gut. Agreed. That one and quite a few others on there had an impact on me that was visceral. David is a life changing song. Not in a huge sense but you are not the same person after you listen to it. So dark. So moving. So oddly tangible because we all know somebody we’d lost contact with who died very traumatically. It happens. Such an incredible song. I’m not sure if The Bird Hunters is in the same arena but I can understand how others might feel that way. Nice pick. I am sad that “They Don’t Make ’em Like They Used to” didn’t get a lot of coverage here, but every time I want to defend Will Hoge, I think about track 7 on Small Town Dreams and know why people are hesitant to trust him completely. I agree about Will Hoge. Small Town Dreams was one of my top 10 albums of the year, but track 7 was pretty bad. I think track 6 (Middle of America) is down there with 7 too. But still, the majority of his music is great, and They Don’t Make Em Like They Used To is one of my top songs of the year as well. I agree 100% with David and Bird Hunters. I think the best part about David is when he mentions his mom being a late night ER nurse and seeing her son come in. Absolutely heartbreaking. Hard to top those lines in the chorus of “David” for me. If those words don’t create in your head images of a horrific scene playing out, and if images of that scene don’t move you, then I’m not sure what will. Great song Mr. Jinks. First time I heard thet line I almost lost it myself. David is an unbelievable song. Great choices, no arguments here. The first time I heard “David” I knew it was going to be a special song.. You get the feeling that through the song you know David and the type of man he is (maybe it’s because I have family members like David). And when the song talkes about his momma being a late night ER nurse…not sure how the most mottcho man would not have at least dropped at least one tear. I think meeting Cody and getting to spend a little time with him after a show this past year might have made me like the song even more. He was a very genuine and down-to-earth guy. Made myself and the wife life long fans of his. The Bird Hunters made me want to pick up Turnpikes first album. I think The Funeral off the first album is as bout as perfect as a story song can get. Bird Hunters isn’t far behind though. Thanks Trig for turning me on to Cody Jinks and the Turnpike Troubadours over the last two years. Diamonds&gasoline( Turnpike’s first album) is amazing. edit:Technically 2nd album but still. Would love to hear the true first album. Three Rivers Song is absolutely spectacular. I wished they would’ve included it on this album with Bossier and Easton, but no such luck. Wonderful songs. Ahhh, if only mainstream radio still played songs where you didn’t want to miss a word from beginning to end. Awesome, David just kind of stopped me in my tracks the first time I heard it. Good choice, especially david, love that song! Cody’s a big favorite of mine! Can’t really get into turnpike, just don’t like the singers voice, sorry can’t get into it! “The Bird Hunters” is flawless; between the wistful mood surrounding the musicianship welded with the confident interplay between the musicians, to the palpable ache you feel the split second Fullbright open his mouth, to the piercing imagery that drives the expanse of the lyrics that just continually builds upon itself to the fevering anticipation of fireworks on Fourth of July (that may always go unrequited)…………….it’s a crowning achievement all around. Same with “David”. Jinks has that kind of hollowed, worn-in voice that sounds effortlessly intimate even if he were reciting the contents of an instruction manual for managing your vacuum cleaner. Very warm and intimate as if you were sitting next to him in a saloon conversing with him, and evinces emotion without once trying too hard. He tends to just let the storytelling do the work. It’s at the 3:09 mark I especially lose it to tears, when the production is dialed down to an acoustic guitar strum and it is revealed the song’s subject had flipped over in a floodplain……………with ache only augmented with his mother being the nurse presiding over the tragedy. Not many songs got me sobbing quite like this in 2015, so that is a testament to how a song can change your life more than ever even if it never gets mass airplay. A little confused to why you say Fullbright , I am assuming it is just a typo? Evan Felker is the singer and songwriter. To me, “The Bird Hunters” is a unanimous #1 for the year. Aaron Watson’s “Bluebonnets,” and Kacey Musgraves’s “Are You Sure (feat. Willie Nelson)” are close runner-ups for me. This may not be a popular choice, but I teared up every time listening to Father’s Day by Butch Walker. I thought Afraid of Ghosts was a great album, maybe not considered country, but deeply personal and real as usual with Butch. I think David is the better song of the two. Beautifully written, its perfect in every way.